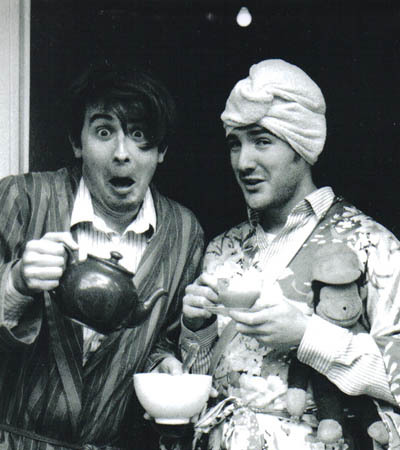 Blue Pepper (Miles Eady and Liam J Stratton) are regulars on the London Comedy Circuit and presently perform a weekly gig at the Kings Head, Crouch End every Wednesday. Their comedy style is slick, sweaty and fast. Blue Pepper have an innovative use of sound and music that weaves through their performance while short sound sketches keep the audience laughing during the changes. no subject is left untouched and no style is left unused. Everyday routines can seem dull and boring to one person but to another they can be a mine of comedy gold. Sometimes it takes someone from the outside to look in on a world and point out its true hilarity and Blue Pepper go out of their way to do this. Blue Peppers Comedy Bonanza(03/2006). Charity event with two 45min sets from Blue Pepper  over £2500 raised!! Sketch Club, Kings Head, Crouch End. Weekly residency at Londons longest running sketch night.